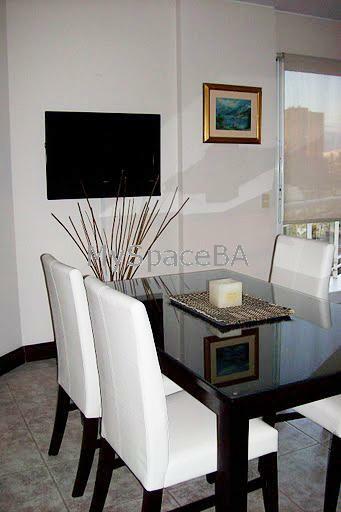 Bright and Spacious one bedroom apartment located in Belgrano neighborhood. This apatment is totally furnished with great and modern taste and a nice view balcony-terrace. The living area has a leather sofa bed and a coffe table. The dinnig area has table and chairs for four people, an LCD 32” and a way out to the balcony. The bedroom has a queen size bed, TV, air conditioner and a very wide closet with mirror sliding doors. The kitchen is fully equipped and coneccted it the dinnig area with a nice open window. The kitchen has fridge, coffe machine, toaster, juice machine, microwave and it is connected to the laundry room. The bathroom has shower and bathtub. TV in Bedroom, LCD 32", TV Cable, Landline Telephone, Air Conditioner, Balcony, Totally Furnished. New building, Doorman 24hs , Elevators. Train station, Many bus stops, Subway, Universities, Commercial and Nightlife Area, Residential Area, Parks, Church, Restaurants, Bars, Banks, Pubs, Exchange House.